Need a bit of help or extra info? The most preferred file format for print ready documents is PDF. PDFs preserve all content in its original, desired state. Thus all fonts, colours, images and layout remain in tact. Please note that PDFs are not meant to be opened or modified once they have been created – changes can only be made to the original files and then re-exported as a PDF. If you are using Microsoft software (Word, Publisher etc) it is essential that you convert these to PDFs before sending them to us – supplying artwork in Word or Publisher allows elements to move and go missing, and we cannot be held responsible for errors when supplied in this format. Documents must be supplied at correct standard sizes (see below), ie: A4 not letter (a US standard size). Please check your sizes before supplying them. Custom/incorrect sizes will incur extra setup charges. All documents must be supplied in CMYK. Documents supplied in RGB will be likely to print colours slightly off target. All documents and images should be supplied at 300dpi. Documents with facing pages (books, booklets etc) should not be exported with or as spreads (two pages side by side). Always supply such documents with individual/single pages. If your document has content that reaches the edge of the page, you must supply bleed. This means that photos, colour blocks and the like must be stretched to reach the 5mm bleed guide on your document. PDF with bleed, go to File > Export… In the dialogue box select Press Quality and in the menu to the left, go to Marks and Bleeds and make sure that 5mm bleed is being exported. It is handy to save a PDF preset with press quality and bleed. Illustrator: Similar to InDesign, save the document as a PDF and follow the above instructions in the PDF dialogue box. Photoshop: As Photoshop does not have a bleed setting; you need to make your document 5mm larger on all edges. For example an A4 (210×297) document should be resized to 220x307mm. Use guides to indicate your page size and margins. A text body in black should not be in registration black. Registration black contains all four colours when printing (Black, Cyan, Magenta, Yellow), and in the process of offset printing it makes it extremely difficult to print, and uses more ink than necessary in laser or digital. Never have text within 5mm of the edge of the document. Always proof read your documents, or have someone else read it for you. When a document has been supplied to print, it is assumed that it is ready to print and already proofed. Printeries cannot accept responsibility for incorrect documents. When using non-standard fonts (downloaded, purchased etc) it is best practice to create outlines, this minimises the risk of errors occurring and fonts going missing. Please ensure all artwork meets all specifications. If art is not compliant we will contact you to supply new art or a fee will incur for us to make your art ready. Simply upload your art at checkout. If uploading multiple files please compress all files in a .zip folder (follow this link if you don’t know how to zip a file Click Here. Please ensure files are under 30mb. 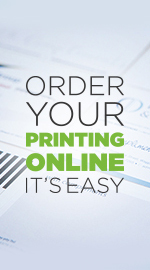 Our online print shop is here for quick easy ordering. We accept payment from PayPal, Mastercard and Visa. Payment is required to place the order. Once order is placed please allow 1-2 working days for our team to check your artwork and send you a proof for your confirmation (we will not proceed until proof is confirmed). Turn around is typically 7-10 working days once proof approved. If you do not have art please contact us to arrange design for you. Please note: Our online print shop only sells our regularly ordered products. We are still fully operational offline with many more products so don’t hesitate to contact us directly if you require something not on our website or if you prefer to order the traditional face to face way with our friendly team via call, email or come in store. Please note that if production has commenced it might not be possible to change details of order. If you wish to cancel your order after it has been sent please contact us immediately via phone or email for us to arrange a refund. If proof has already been confirmed and production has commenced it might not to be possible to cancel an order. The full payment for your order (including the product price and applicable delivery charges) is deducted from your credit card on completion of your order. Delivery will commence once payment has been processed/validated. We accept payment by Visa, MasterCard, PayPal and Direct Deposit. Credit card details are processed in store and immediately terminated once payment is successful for security. We ship within Australia only. We charge a fixed cost of $10 for deliveries within Australia (as varied from time to time and subject to a surcharge for large orders). To find out the shipping charges that apply to you, simply add the items to your shopping cart and proceed accordingly to the checkout where the full cost will be calculated and displayed before you make any payment. It is your obligation to enter the correct delivery address details at the time of ordering. We are unable to deliver to a P.O. Box. We use all reasonable efforts to dispatch orders within 7/10 business days of the confirmed proof date. Once we learn an order has not arrived within a reasonable period we will lodge an enquiry with the courier and advise you of any issues that are discovered. The personal information we collect and hold is what is reasonably necessary for our business functions and activities. When we collect and hold personal information, it is of the following kinds: your personal details such as your name, addresses, telephone numbers, age and gender; your customer reference number Depending on the nature of your dealings with us, we may collect and hold other types of personal information. For example, information collected and held via our secure financial systems about the debit or credit card you might use for your purchases from us. You generally have the option of not identifying yourself or of using a pseudonym when dealing with us. But not where this is impractical (for example when you shop online with us) or where the law or a court order provides otherwise. When we collect, hold and use your personal information, we do so primarily to sell and promote our goods and services to you and to improve on the range of our offerings. For example: to learn of your likely preferences so that we may promote our goods and services to you in a way which may be of most interest to you; and to assist in investigating your complaints and enquiries. We disclose personal information we collect for purposes which are incidental to the sale and promotion of our goods and services to you. For example, we may disclose your personal information within our group, to service providers who assist us in our day-to-day business operations and as part of buying or selling businesses. We may collect, hold, use and disclose your personal information for other purposes which are within reasonable expectations or where permitted by law. When marketing to you, your personal information is only ever used or disclosed for Quick Print’s own purposes. You may opt out of our direct marketing to you. Our direct marketing materials will tell you how to do this. We may de-identify your personal information. We may do this for use and disclosure of the anonymous data to determine preferences and shopping patterns. More information about privacy law and privacy principles is available from the Privacy Commissioner. The Privacy Commissioner may be contacted at www.oaic.gov.au (email –enquiries@oaic.gov.au) (Australia). If you have any complaints about our service or product please contact us via phone, email or in person and we will work with you to resolve the issue.